Environmental Engineering Handbook from C.H.I.P.S. ALL THE TECHNIQUES YOU NEED IN A SINGLE SOURCE. Want to determine if a hazardous chemical is present in soil, air, or water? If so, in what concentration? Want to confirm that the environment is free of certain contaminants? TEST AND ANALYZE AIR, SOIL, AND WATER - Just the thing to reduce trips between office and field, and boring searches through unfamiliar literature, this value-packed reference puts all the testing methods, techniques, and tips you need in a single place. 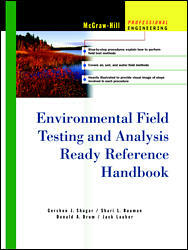 This handy book is ideal for anyone in environmental protection, assessment, testing, education, outdoor recreation, highways, public health and safety, emergency services, forensics, geology, surveying, or construction. Solids, Gels, Oils, Sludges and Nonaqueous Substances.